Rusty hills dotted with sagebrush and paddle cactus blurred past the window. I rested my forehead on the cool glass and stared at everything. And nothing. A familiar fluttering of anticipation ebbed and flowed in my stomach. I was at a crossroads. A borderland, if you will. One foot still planted firmly in my childhood. The other testing the waters of that strange vista of preteen-hood that so badly wants to play; but longs even deeper to be cool. Inside, the heart of a little girl beat with giddy excitement at the prospect of Christmas in the mountains. With snow. Even armed with the knowledge that the elevation of the little cabin made it possible for flurries of the magical white powder, full on snowman-making-snowball-fight-inducing-must-make-a-snow-angel coverage was rare. If you could have seen the heart of me you would have found a freckle-faced girl with pigtails in a plaid flannel nightie clutching her teddy bear hopping up and down unable to stand the suspense. To look on the outside you would have seen the stereo-typical preteen (sorry, can’t bring myself to say tween) girl. AKA – I played it cool. The true definition of apathy embodied. That is until we rounded the bend and saw it. Snow! Loads of it. Tons of it. Everywhere. Insert cheesy Snow song from White Christmas here. 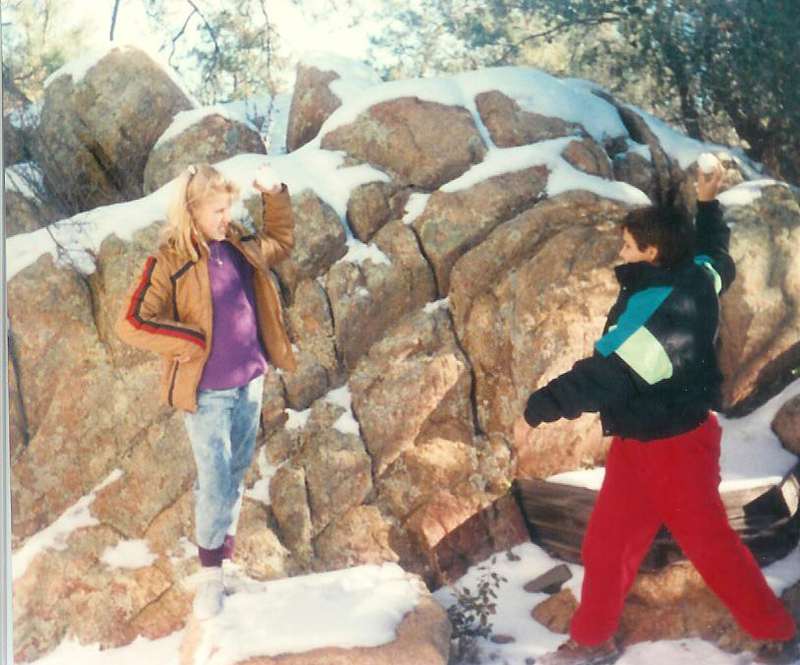 My brother and I living it up in the snow…and some rockin’ puffy jackets! Cool was holding on tight, refusing to give in… until we saw the cabin. Like a gingerbread house come to life, it sparkled in the crisp powder. The corners of the windows frosted, leaving only a circle in the center. Perfect for peering through while sipping cocoa. (I would find out later it was snow-in-a-can applied by my grandparents, but I didn’t care). Once inside and unpacking, it didn’t take long to figure out that the pipes were frozen solid. Not a hope of thawing. Back into town we headed to get bottled water and other essentials. Driving down the ever so charming “main street” of this quintessential quaint little town we took in the beauty and serenity only the aftermath of a blizzard can provide. In a small courtyard off a side street stood a fountain. It’s spray completely and perfectly frozen in formation. There’s talk among the adults of packing it up, calling it a day and heading the two hours back down the mountain; back into the plain desert full of brown and sun. We can make this work. Let’s do it. The can-do spirit oozed from every person, young and old. The next few days were spent cooking with bottled water; snuggling under insufferably itchy woolen blankets watching The Man from Snowy River on the tiny retro screen. Melting snow in a cast-iron pot over the fire to use for washing faces and flushing the toilet. I felt like I had stepped into the pages with Laura Ingalls Wilder and we were pioneering some uncharted territory with our little family spanning four generations under one roof. My brother and I jumped with both feet back into our childhood and spent days playing in the snow; exploring; laughing; throwing. Sitting on a boulder staring up at the too-blue-for-words sky listening to the pines creek in the breeze. Utopia for two city kids from the desert. Christmas day brought laughter, hot cocoa with whipped cream, gifts and more laughter. Our dinner was made simple out of sheer necessity. But somehow no cuisine has ever tasted so rich. Yeah, I did it. Picture of me taking a picture of you. And slouch socks. You might say that was my last Christmas as a child. 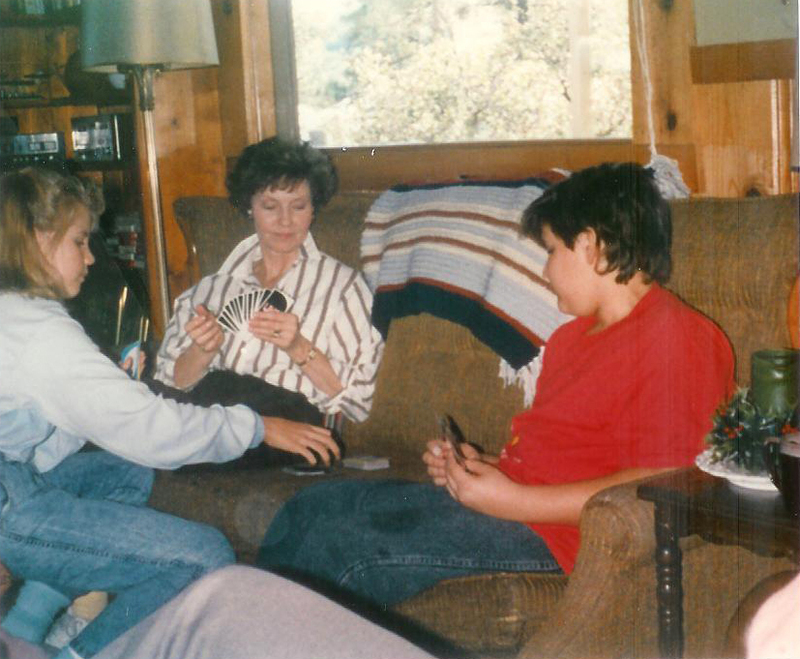 All I know is that year – the Christmas at the cabin – goes down as the most magical, memorable, and happiest of my entire childhood. And I marvel at the magic that was rekindled in the heart of moody, socially awkward 12 year old just by the presence of some snowflakes and a family that loved her and let her be who she really was. Who loved who she really was. 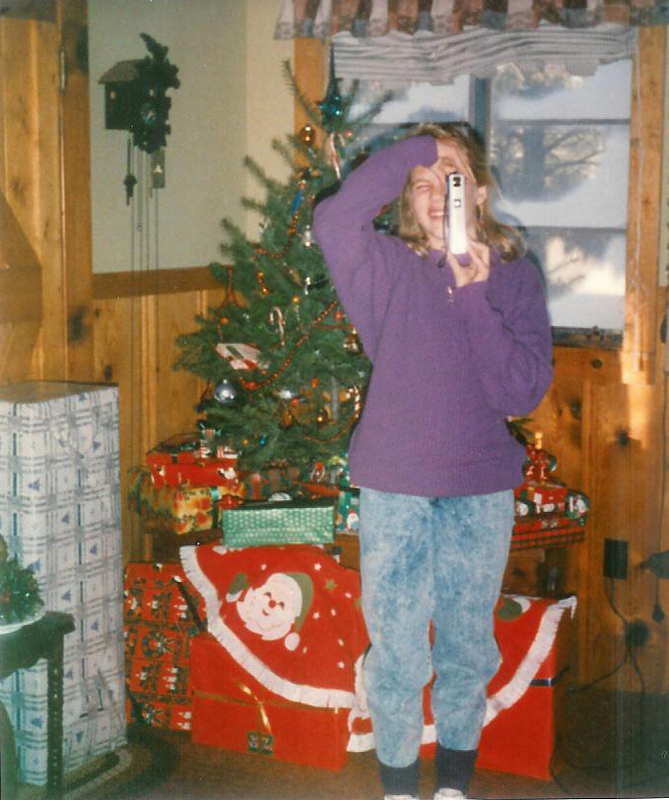 And who wasn’t afraid to rough it for a few days to make sure she got to really experience the Magic of a Childhood Christmas. This post is the first in a series relaying stories from friends from around the world sharing their favorite childhood Christmas memory. 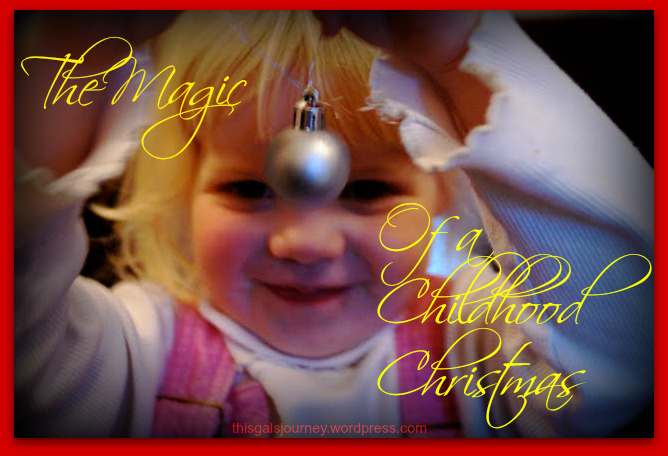 The last week of the series we will host a link-up so you all can share in the magic! So get thinking, dig out the old photos and be ready to link up your story, too! Oh, how your words speak of longing, longing for something you have not yet truly lost. I live in South Africa where we celebrate Xmas during our summer with another charm and beauty, yet, I love experiencing a white Xmas with you on your blog. Beautifully written! I know that mixture of adolescence and longing well. Stonewashed jeans! And the bangs! I even have a younger brother! Memories from my pre-teen years too! We would have been fast friends! What a memorable Christmas you all had! And how beautifully you shared!